Extension options doesn't work in Thunderbird 60 beta. Empty page. No way to install styles. Maybe use old userChrome.css / userContent.css - should still works. If these workarounds do not interest you then you have to wait for the Thunderbird 60 add-on support enlargement or repair advice to be something else than bypassing the problem. 2.1.1 doesn't seem to work either. UserStyles doesn't detect Thunderbird and there is no way to get into options to install style manually. It's under Profiles. The Trick everyone seems to miss is file properties. Read-only should be set for the css before running Thunderbird (using the latest v60+). Ctrl+Shift+i will open the Developer Tools. After allowing it to run1, you can view the DOM elements and include each one specifically by Class, attribute, ID or path , if you don't really want the * selector. Also, if anyone found a way of coloring the column headers, i would be so happy. Still haven't found what property is it or if it's using windows' shell. You can try downloading my add-on for Thunderbird at https://sonco.synthasite.com/thunderbird-tweaks.php coded for Thunderbird 52.8.0 I don't like coding for beta versions (too many changes) and wait for the official releases. 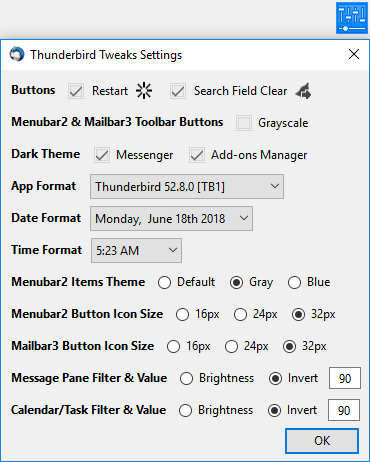 Various tweaks and optional Dark Theme from Add-on Manager Option button in category Thunderbird Tweaks or the add-ons toolbar button (see below thread for pic). Also adds id's, versions and date updated info to Add-on Manager category items. Aye, i downgraded my version and this works finely. Thanks man. Ps. how do i stop it from resetting on load? What is resetting on load? Need more detailed info. The change of coloring, it turns to default(white) every time i run thunderbird(v52.8.0 32-bit). I need to click again on every option to re-activate everything. If you need any file properties info, settings or anything specific, ask away, i really like your extension and need it to work. I actually see that i have a different(based on TB) version of your extension, since it is 53.6.2. Does that matter? The checkboxes in the Options dialog, opened by the Thunderbird Tewaker add-on toolbar button, do not stay checked? On reload, the checkboxes in the dialog are all unchecked? The options stay as i chose, the effect just isn't there until i re-activate them. Try disabling your userChrome.css file. Can disable by renaming the file like XuserChrome.css and restart Thunderbird to see if problem lies in there. If not, rename file back to userChrome.css and we'll go from there. The Thunderbird Tweaker add-on version number has no correlation to TB version. Should i assume that the folder chrome which is read-only, is at fault? The file properties of the userChrome.css file should have the Read only and Hidden checkboxes both unchecked. Give that a try and see what happens. The profile options in the settings only display, on the toolbar, what profile you are using and not a selection of a profile. Thanks for your time, i have a problem with powershell messing around with forced read-only file properties and as i understood, i could fix it when i fix my files' attributes. There are also several buttons added to your Customize Toolbar Palette you may find useful as well. Just drag them onto a toolbar. I had to edit your js for it, now it'll be by you, the creator which is perfect. edit: and it works Finely. Grazie again!